Our design team has been inspired by a specific area in developing some specialised new additions to our Duchbone range: wine and drinks. 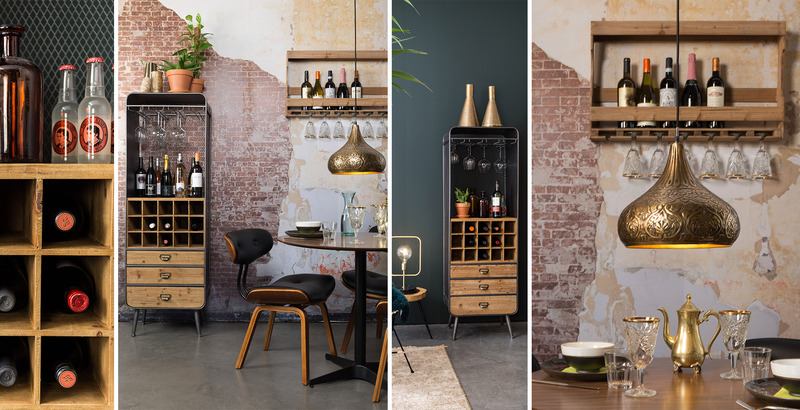 Our Vino and Lico cabinets and our Mil trolley are all amazing wine and drink-related furniture items that let you store and serve your personal collection in a stylish way. The new items are all in line with the new interior trend, Sophisticated Chic, that revolves around style and luxury. An attractive cabinet for your wine and other drinks is an essential element in your home to ensure that you always have a lovely bottle of wine to serve friends and family within easy reach. Having a wine cabinet in your interior is very fashionable. We aim to create tasteful well-thought-out interiors and we make use of luxurious materials and warm colours to achieve this. We enjoy dining in style, preferably at long tables with as many friends as possible, and then lingering at the table and enjoying a good wine together, or indeed several different wines. Now, Dutchbone is the place to go if you want to present and serve your favourite selection of wine and drinks in style. Let our new (wine) items inspire you. "Our aim is to create tasteful well-thought-out interiors and we use luxurious materials and warm colours to achieve this”"
A wine and drinks cabinet in the form of a chest is an essential item in our collection. This is why it was love at first sight when the Dutchbone team saw the Lico cabinet. Our team goes on frequent trips looking for attractive and inspiring new products to add to the Dutchbone collection. We love trunks, chests and storage furniture. When our design team saw Lico, they saw the ideal cabinet to your loveliest whiskies and wines. Next time you go on holiday to France or Italy, you can stock up on a selection of wines, because you have plenty of space to store them all at home. 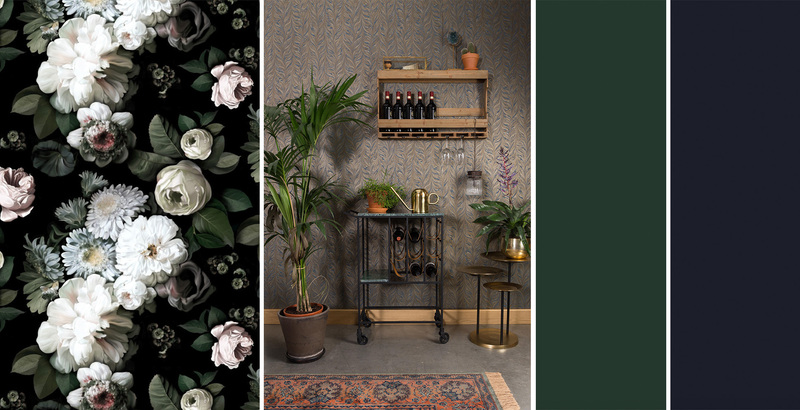 The Dutchbone Lico wine cabinet makes a lovely combination with velvet fabrics, pretty prints on the walls and warm colours. Dutchbone Lico fits perfectly with a Sophisticated Chic interior style. The cabinet goes well with luxurious furniture with velvet fabrics. Choose warm colours and pretty prints on the wall. The cabinet also combines well with gold-coloured lights and brass tables. Have you already thought of the ideal place for this rolling wine and drinks cabinet? For people who prefer to keep their favourite wines in full sight, we have the Dutchbone Mil trolley – a stylish trolley with green marble top surfaces. The green marble with a lovely veined surface fits perfectly with the Sophisticated Chic trend. Put Mil in a nice corner, surrounded by furniture and accessories in green or dark blue. For furniture, choose luxurious materials such as brown leather to give your interior a stylish touch. Choose distinctive wallpaper with a print. Do not be afraid of overdoing it. In this case, the motto “less is more” does not necessarily apply. Mil is a drinks trolley in heart and soul. The large top is perfect for pouring drinks and also for placing valuable items. The Dutchbone Mil trolley features leather straps that you can use to hang up to nine different bottles, for example, for a selection of bottles from different famous wine regions. How do you like this stylish trolley with robust industrial elements? If Mil does not have enough space for your collection, take a look at our robustly styled Tres wall cabinet – a wooden wall rack that you can use to hang up to seven glasses and to store bottles in the handy compartment. 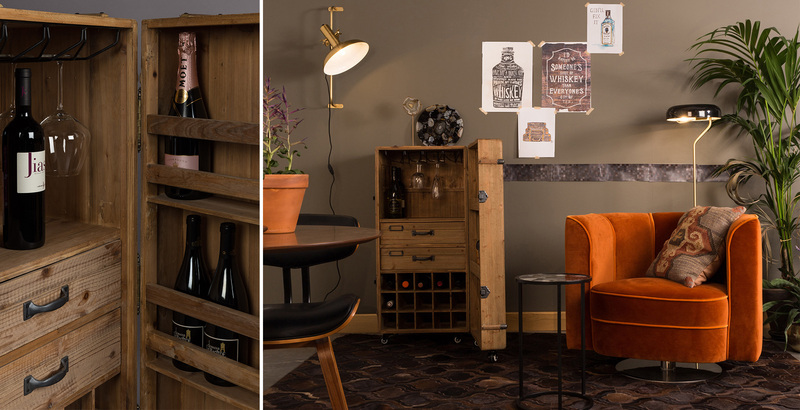 Our Dutchbone Vino wine cabinet looks as if it had been taken from a picturesque restaurant In Provence and is the perfect furniture item for real wine lovers. It provides enough space for lots of wine bottles. The cabinet also gives your best wine glasses a place of honour. You can hang them on the special rack or place them on the shelf. You can use the three drawers for accessories like bottle openers and corkscrews. Extra storage space is always useful in a home, so put whatever you need to into it. The Dutchbone Vino cabinet provides space for storing wine glasses and bottles of wine.